Apple's WWDC 2017 is just a few hours from now, and the company is, presumably, doing some last-minute preparations for what we expect to be several big announcements. As evidence, we present the short-lived (for now) listing of an Apple-made iOS app called "Files". 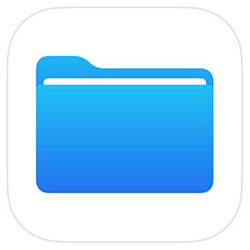 For those not aware, iOS has thus far taken a hard stance against letting users access the file system, so as to simplify the overall user experience. And while the question whether this is a good or bad decision is still open, all facts point to it being overturned with the release of iOS 11. Also, the app reportedly requires iOS version 11.0 or higher, meaning it relies on functionality current iOS versions lack, further solidifying this theory. Unfortunately, we don't yet know what the app will look like, as the listing seems to have been simply a placeholder. Its icon, though, a blue file folder, seems pretty indicative of its intended purpose. Knowing Apple's ways, though, one shouldn't expect full, unfettered access to their device's hard drive – not even Android offers that (without root, that is). Instead, what we're likely to see is a new, user-accessible section which will contain essential files such as photos and music, and to which app developers will have access to, should they choose to. Or in other words, a more convenient way of doing the same things we have been able to thus far. That's it Apple! Shamelessly copy all the Android features. Seriously. Do it. As an iOS user having access to local files gets me hard, I hope they merge it with iCloud too like on macOS. Split screen might be nice on plus models too but I won't get my hopes up. Everybody copies everyone. Deal with it. If they were smart enough it wouldn't have required me to tell them. Sadly they aren't. All fanboys I mean, not just the ones mentioned. By that, android copied symbian too. Anyway, its not a copy, its just a natural feature they should have put a long time ago and a natural evolution of ios at this point. "its just a natural feature they should have put a long time ago and a natural evolution of ios at this point. Letting users access the file system is natural evolution? LMAO... It's clearly more like playing catch up. SMH. While his comment is idiotic, there is a difference between a file manager and a file system. He never claimed Apple was copying a file system. Baby steps to being functional and productive! Nice! What you say now TROLLS??? You chill with your 5s . Shoo shoo. Why don't u leave this piyath guy alone? Because he's a racist price. Soon you will be banned along with the banned racist account. Get rekt. Why don't you and him put an end to your ridiculous trolling and double standards? I say about time jesus I had a galaxy S2 back in 2012 that had this and god only know when other OEMs had it too. Now 5 years later Apple is getting this? And it still won't be as open as the Android way so don't get too carried away. Whats to say. Its not gonna be like it is on Windows or Android, or even Linux for that matter. Its gonna be pretty much like the DCIM folder. You can more files to it, and uou can likely point other apps to it. But you likely wont see any other directories. Its not not be an open file system. Its gonna be a folder with permissions set for you to use it...just like the DCIM folder. May sure you save this post. Took long enough. 10 years to have something Windows, Android, and other platforms had on day one. If this happens screw this S8. Beautiful phone but terrible software experience (TouchWiz). S8 has Samsung Experience, not touchwiz. It's another thing they both have mostly styling differences. Finally. Next innovation is apps drawer and widgets lol. iOS 10 already has widgets. Finally.. I can go back. So you changed OS because of a file manager?